Last night I had the pleasure of being entertained by Cirque du Soleil: Quidam. It was the first Cirque show I have ever been to and I was highly anticipating a great night out with friends.We were not disappointed! Since the show didn’t start until 7:30pm, we decided to leave the boys at home with my mom (thanks mom!). That said, after seeing the show I would definitely consider bringing them next time. It was a lot more kid-friendly than I expected and I think it would be totally fun from around age 6 and up. Quidam was full of exciting feats of strength, flexibility and moments of OMG I can’t believe the human body is capable of doing that! I thoroughly enjoyed myself. I don’t want to spoil the show by giving away too many details. But I was pleasantly surprised by a few themes that I hadn’t expected. Humor: One thing I definitely was not expecting from Quidam was humor. However, there were several laugh out loud moments that really made for a fun night! Live music: Do all Cirque du Soleil shows have live bands accompanying the performers? I had no idea if that is the case and was very pleasantly surprised by the wonderful musicians who played beautifully. Simplicity: I had heard that Quidam was more simplistic than some of the other Cirque shows out there. But having never seen one, I had no basis for comparison. That said, the set and stage were very simple and the focus truly was on the performers. Because of this, I could easily imagine that I was sitting in some French theater 100 years ago instead of a massive Arena in Raleigh, NC. That was pretty cool. I highly enjoyed the show and I would definitely recommend it! If you are in the Raleigh, NC area you can catch Cirque du Soleil: Quidam from now until Sunday! 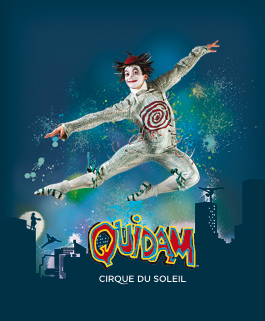 Have you seen Quidam? What did you think? Disclosure: I was provided with tickets to see Quidam for the purpose of facilitating this review. All opinions are my own. Thanks for reading! OMG I know! The performers were 1000% muscle. It was so cool. I am glad to hear your daughter loved it too! I can’t wait to take the boys when they are a little older. Bummed we missed seeing you guys last night. Joe and I kept commenting on things we knew would upset the boys if they were there… like when they released all balloons, they would have freaked out.